New Zealand, 1864, Queen Victoria "Chalon Head", 6d red brown, perf 12½, Large Star watermark, unused without gum, brilliant rich color with sharp impression, fresh and Very Fine. Scott No. 36. Campbell Paterson No. A5h (2). SG No. 122 £350 ($460). New Zealand, 1864, Queen Victoria "Chalon Head", 6d deep red brown, imperforate, Large Star watermark, used from Nov. 1866, large margins all around, deep intense proof-like color and impression, bold central strike of Nelson "N/1" cancel, fresh and Extremely Fine gem. Scott No. 36 var. Campbell Paterson No. A5h (X). SG No. 122 var. Estimate $300 - 400. 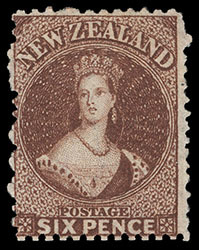 New Zealand, 1864, Queen Victoria "Chalon Head", 6d brown, perf 12½, Large Star watermark, horizontal block of 10, bright color with clear impression on bright paper, cancelled by strikes of "Dunedin, MR - 20 '67" duplex, small flaws including staple punch holes and crease in bottom left pair, still Very Fine and exceptional used multiple. Scott No. 36b. Campbell Paterson No. A5h (4). SG No. 122a Estimate $750 - 1,000. THE LARGEST RECORDED USED BLOCK OF THE 1864 6D BROWN PERF 12½ ISSUE. New Zealand, 1864, Queen Victoria "Chalon Head", 6d red brown, perf 12½, Large Star watermark, tied by sharp numeral "5" barred oval, matching "Campbelltown, Southland, JY 21, 69" cds backstamp on folded letter from Ruapuke Island to Wellington at double the 3d interprovincial rate for up to one ounce, Aug. 7th arrival backstamp, letter datelined July 17th was written by Lutheran Missionary Rev. J.F.H. Wohlers; file folds, Very Fine and scarce origin, Gerald Ellott. Scott No. 36. Campbell Paterson No. A5h (2). SG No. 122 Estimate $300 - 400. Ruapuke Island is one of the southernmost islands in New Zealand's main chain of islands, lying 15 kilometers to the southeast of Bluff Harbor (Cambelltown). It was named "Bench Island" upon its European discovery by Captain James Cook in 1770, but has rarely been known by any other name than its Maori name, which means "two hills". It guards the eastern end of Foveaux Strait. New Zealand, 1864, Queen Victoria "Chalon Head", 6d pale red brown, perf 12½, Large Star watermark, bright shade, tied by indistinct numeral barred oval, matching "Lyttleton, New Zealand, AP18, 68" rimless backstamp on cover to Stockton Me., endorsed "Via Panama" at top left, Very Fine. Scott No. 36. Campbell Paterson No. A5h (3). SG No. 122 Estimate $400 - 600. Cover is prepaid 6d for the ½ oz. rate to the United States via Panama, across the Isthmus by rail, and then contract steamship to New York. Due 10¢ for arriving steamship mail. 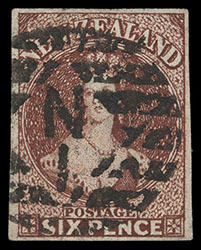 New Zealand, 1864, Queen Victoria "Chalon Head", 6d pale red brown, perf 12½, Large Star watermark, tied by numeral barred oval, 1s stamp has fallen off after posting but prior to arrival at New York, matching Palmerton (10.3) origin cds on cover to Norwalk Conn., "Dunedin, Registered, OC 3, 1868" registry double-oval, magenta "Registered", "New York, Nov 14" arrival cds also ties 6d, blue crayon "Due 10¢" at bottom; overall toning and edge wear, Fine and scarce registered use to the United States. Scott No. 36. Campbell Paterson No. A5h (3). Cover was prepaid 1s for the registry fee plus 6d for the ½ oz. rate to the United States via Panama, across the Isthmus by rail, and then contract steamship to New York. Due 10¢ for arriving steamship mail. 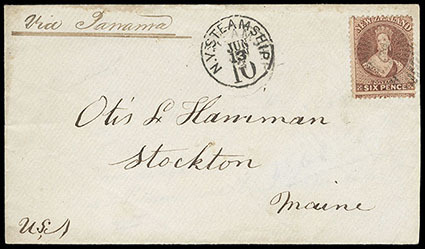 An unusual use with the one-schilling value falling off after mailing, but prior to receipt in New York. 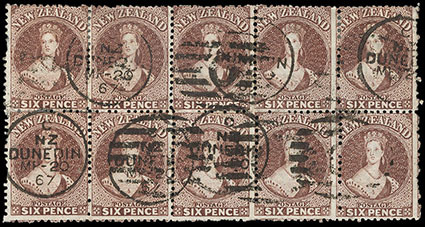 New Zealand, 1864, Queen Victoria "Chalon Head", 6d red brown, perf 12½, Large Star watermark, tied by "Dunedin, MR 18, 69" duplex on blue cover to Mohawk, Canada, red manuscript "6" rating at left, red London Paid (5.22) transit cds and red crayon "1" pence colonial credit, Hamilton C.W. (6.2) transit backstamp, F.-V.F. Scott No. 36. Campbell Paterson No. A5h (2). SG No. 122 Estimate $200 - 300. 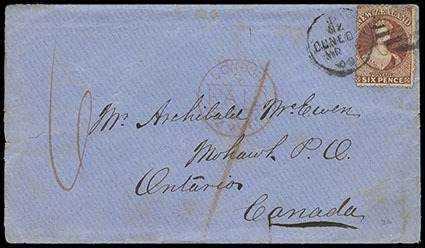 This letter was prepaid 6d for a ½ ounce letter to Canada via Panama, but actually sent underpaid at the 1s rate for a letter via Suez and the United Kingdom (effective Jan. 11th 1867 to Nov. 21st 1871). 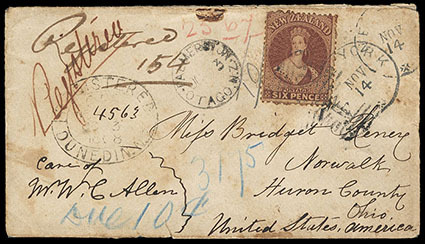 New Zealand, 1864, Queen Victoria "Chalon Head", 6d red brown, perf 12½, Large Star watermark, tied by "Auckland, DC 10 '68" duplex on cover to Southampton, reverse with Southampton Packet Letter (2.25) arrival cds, forwarded to Cannes, France with G.B. 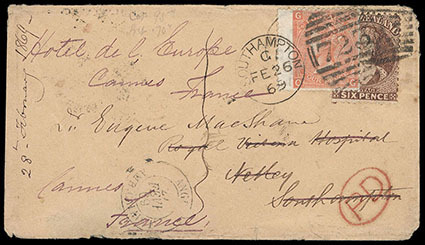 4d vermilion tied by "Southampton, FE 26, 69" duplex, London (2.26) backstamp and red "PD" oval handstamp, Cannes (2.28) arrival backstamp; some edge wear, Very Fine and attractive remailed combination use. Scott No. 36. Campbell Paterson No. A5h (2). 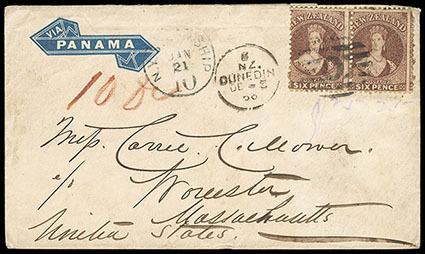 New Zealand, 1864, Queen Victoria "Chalon Head", 6d red brown, perf 12½, Large Star watermark, horizontal pair, tied by numeral "0" thick barred oval duplexed with "Dunedin, DE 5" cds on "Via Panama" blue embossed ribbon cover to Worcester, Mass., United States, partial "N.Y. Steamship, 10, Jan 21" due cds and red crayon "10 Due" rating adjacent; some light soiling, Very Fine. Scott No. 36. Campbell Paterson No. A5h (2). 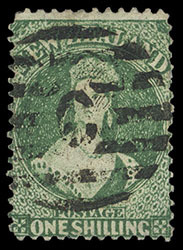 New Zealand, 1864, Queen Victoria "Chalon Head", 1s deep green, perf 12½, Large Star watermark, nicely centered, strong rich color, bold strike "C" barred oval, faint crease, Very Fine appearance. Scott No. 37 var. Campbell Paterson No. A6m (7). SG No. 123 £350 ($460).